I try to encourage the kids to read as many classics as possible. I think it is a wonderful benefit of homeschooling. I spend a lot of time searching out comprehension units to go along with books for the kids each semester. I was very excited to get the opportunity to review the Sixth Grade Literature Guide Set ($95.00 without accompanying books) from Memoria Press. Joey has become more open to reading classics, but I want him to get as much information as possible out of each book that he reads. There are fun books, but then there are books that we use for school reading. He enjoys reading about the Middle Ages, and the Sixth Grade Literature Guide Set fit his taste perfectly. The Sixth Grade Literature Guide Set was a perfect fit for Joey's reading interest. He was able to start exploring books like King Arthur, Adam of the Road, Robin Hood and The Door in the Wall. The Memoria Press Six Grade Literature Guide Set was specifically designed to encourage a child's reading comprehension progress. To encourage their skills of finding the information needed. Vocabulary and spelling skills are also encouraged in each section. This is all done using the Student Study Guide that goes along with each book in the grade level that you purchase. Each book is broken down by chapter. This is clearly identified at the bottom of the Student Study Guide pages. Vocabulary and character identification starts each chapter review. Each chapter review also contain 5 - 10 questions that require critical thinking and writing skills. Other activities include matching quotations to characters, open discussion questions and enrichment activities that include short answers or drawing projects. You can view a sample of the Robin Hood Student Study Guide here. I really feel that the Six Grade Literature Guide Set would make a great addition to go along with a study of the Middle Ages. So you could easily match up history into your literature study. (This by the way could also be done with other grade levels). Joey was easily able to cover a chapter a day with the daily chapter review in his Student Study Guide. Even though he does have learning delays when it comes to comprehension, he didn't feel overwhelmed with the questions asked or the vocabulary introduced. 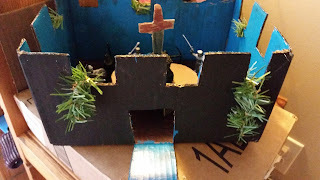 In fact, he finished King Arthur and His Knights of the Round Table and even did his Book Parade project over this book he enjoyed it so much. I was able to ask him questions and he came up with his design based on what he was able to remember from all his reading and activity. Included in your purchase of the Sixth Grade Literature Guide Set are Teacher Guides for each book. In each Teacher Guide, you will find the answers to the student questions for each chapter. You will also find Quizzes and a Final test about the book. This was very helpful, unless you are reading the book along with your child, which I wasn't doing. Like I mentioned earlier, my kids are reading books that I never go the chance to read in school. 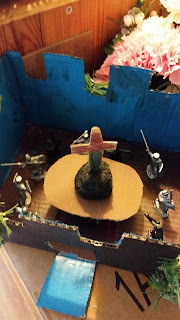 I was very impressed with the Sixth Grade Literature Guide Set is a wonderful addition to our homeschool. I am already looking at other levels for the Lydia and Caty to start using. I was very impressed, and think we will be starting with the Second Grade Literature Guide Set and work our way through all the materials. You can purchase the Sixth Grade Literature Guide Set in two ways. One way with just the Student Study Guides and Teacher Manuals. The cost for this is $95.00. Or you can purchase the Student Study Guide, Teacher Manuals and a copy of each of the books for $118.00. This way makes it easier if you do not already own copies of the book, one stop shopping. Several members of the Schoolhouse Review Crew were given the opportunity to try out various grade levels of the Literature Guide Sets from Memoria Press. You can visit the Review Crew blog to see how these fit into their homeschooling. I love the castle project. My son read Robin Hood, but wants to do King Arthur next. Thanks for all the information on this curriculum. It really helps me to decide if I want to use this next year.